All is not just work at Buddsteel Architectural Products Ltd.! 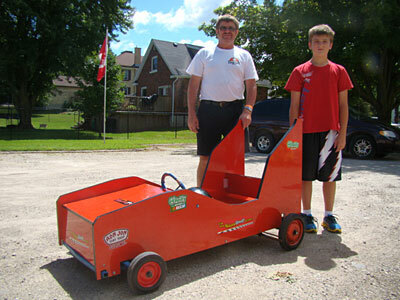 During the recent Mildmay Carrick 2013 Homecoming Soapbox Derby, the expert Buddsteel ‘soapbox engineers’ had an opportunity to show off Buddsteel’s laminate construction skills with the ‘Budd-mobile’. Rugged and durable, like all Buddsteel products, the Budd-mobile flew down the course, narrowly missing the podium against much heavier soapbox entries. In the photo ‘chief engineer’ Wayne Fischer and ‘test pilot’ Trevor Fischer (grandson of owner Alf Grubb) prepare for the derby.